Holy Week isn't just a school holiday when kids color eggs and dress up like bunnies. For progressive faith leaders who represent the ISAIAH coalition of churches and social justice believers, remembering the passion, death and Resurrection of Christ is a sacred time, and an appropriate time to call out sin and to come to the aid of those in need. It's also a propitious time, the religious leaders decided, to call on lawmakers and the banking industry to stop fighting laws empowering home owners facing foreclosure. So on Maundy Thursday in the Minneapolis suburb of Brooklyn Park, half a dozen people of the cloth gathered in front of a vacant house, a home abandoned by a family of six after they defaulted on their mortgage during the 2008 financial crisis. 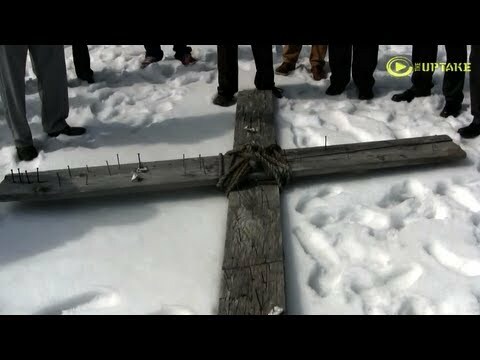 With a wooden cross punctured by nails lying on the snow before them, leaders of Isaiah/Faith in Democracy prayed and preached the need for enshrining homeowner rights in state law, and for an end to the bank-driven home foreclosure crisis. "As people of faith, we remember Holy Week as the time when Jesus came to redeem people from sin, from shame and from destruction," said Rev. Paul Slack, the pastor of New Creation Church in Minneapolis and the President of ISAIAH. "When we see all the unnecessary foreclosures in Minnesota, we see that as sin." Part of Isaiah's program is an on-going effort "to create a Minnesota that seeks fairness in all its dealings, eliminating financial discrimination against communities of color, supporting best practices in foreclosure prevention, and taking an aggressive approach to enforcing fair lending laws." The group has been working hard to convince Democrats who control the Legislature to support a "Homeowners' Bill of Rights" that would establish a single point of contact for struggling homeowners, stop "dual-tracking" practices by banks and require automatic mediation between every person facing foreclosure and their lender. But the effort has been frustrated, so far, by the reluctance of some Democrats to oppose the banking industry and its lobbyists. Rep. Mike Freiberg, (DFL-Golden Valley), introduced legislation modeled after California's Homeowners' Bill of Rights, which advocates say has significantly reduced foreclosures and evictions. But Freiberg's initiative was stonewalled in committee, as fellow Democrats watered down the legislation after the banking industry objected. "Financial institutions and corporations are experiencing record-breaking profits," said Pastor Slack. "We call upon them now to join us in the redemptive strategy of keeping families inside their homes...We need to think about the people who lived in this home. Not just the home, not just the dollars behind it, but the children who were growing up here." Though the deadline for introducing legislation has passed, Rev. Grant Stevensen of Saint Paul-Reformation Church in St. Paul said he hopes Democrats (who have a majority in both chambers) will still push the bill forward, bring it to the House and Senate floors for a vote and present it to Governor Mark Dayton — whom activists hope would sign such a bill. Stevensen recalled that in the late 1980s, a similar political battle was fought between banks and farmers who faced foreclosure. At the time, the banks resisted efforts to make them enter into negotiations with the farmers. "If you ask (the banks) today what they think about the mediation between them and farmers, they would say it was good piece of legislation because it helped us keep so many family farms," said Stevensen. "Five years from now, after we pass the homeowners' bill of rights, banks that are currently saying 'this is not a good idea' are going to be saying 'that was a good idea'. It was good for our communities. It was good for our families. And it was ultimately good for the banks."